There’s no question that Google is setting its sights on taking some of Microsoft’s marketshare in the productivity suite space. Last year, Google announced a new plug-in that syncs Google’s enterprise versions of Apps, including Gmail, contacts, and calendar, with Microsoft’s Outlook. And Google just acquired Docverse, an application lets users collaborate directly on Microsoft Office documents. Today Google is taking another swipe at Microsoft with a new tool that makes it significantly easier to make the switch over to Google Apps from Microsoft Exchange. 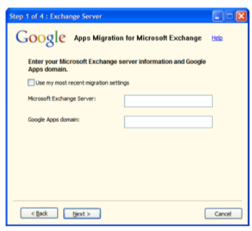 Google Apps Migration for Microsoft Exchange is a new server-side tool that migrates a company’s email, calendar and contact data from Microsoft Exchange, an email server software product from Microsoft, to Google Apps. Google promises ease with the tool, allowing IT administrators the ability to select the mail, calendar and contact data to move in phases and migrate hundreds of users at the same time. 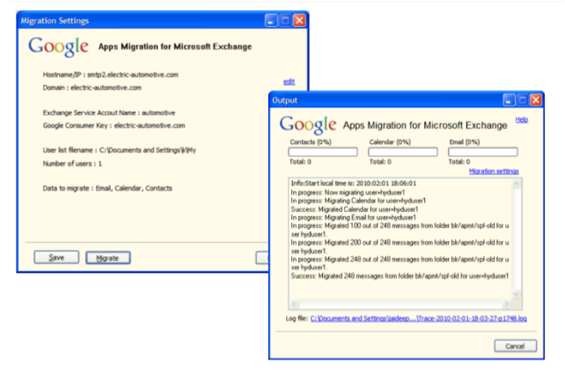 Plus, employees can use Exchange during the migration without any interruption. The tool works with Exchange 2033 and 2007 for both on-premise and hosted applications and is available to the enterprise and education versions of Google Apps. This is clearly a play at showing businesses how simple it is to move from from Microsoft products, such as Exchange, that may not be hosted in the cloud to the cloud-based Google Apps product. Google product Manager Matt Glotzbach told me that the search giant wants to make it as simple as possible for potential customers to make the switch to Google Apps, and many potential Google Apps’ clients are using Microsoft Exchange to host and power email, calendar, and contacts. Google also launched Google Apps Migrator for Lotus Notes and a Connector for BlackBerry Enterprise Server. Google Apps has steadily been growing; already 25 million people are using the Apps product. And that also includes over 2 million businesses ranging from startups, to small businesses, to Fortune 500 companies. And Google is developing a compelling ecosystem around Google Apps, recently launching the Google Apps Marketplace, which is an an app store for enterprise apps in the cloud.